Statistics show that despite popular stereotypes if you’re young and queer you’ll do worse financially than your straight peers. To beat those stats, here are our money smart moves for gays at 21 years old. David was kicked out of his house because he’s gay and suddenly had to adapt to living life flying solo. David’s experience is why we want to help those with similar struggles and why we came up with these money smart moves to ensure financial independence and success for young LGBTQ adults. Whether you’re forced to fly solo or just want to be independent, follow these steps for your success. 1. Get rich early: The minute you qualify for a company sponsored retirement plan, such as a 401(k), 403(b), SEP or SIMPLE IRA (Individual Retirement Account), sign up for it and immediately contribute 20% or more of your income to it. Financial security requires successful investing and time in the market is the key to successful investing. 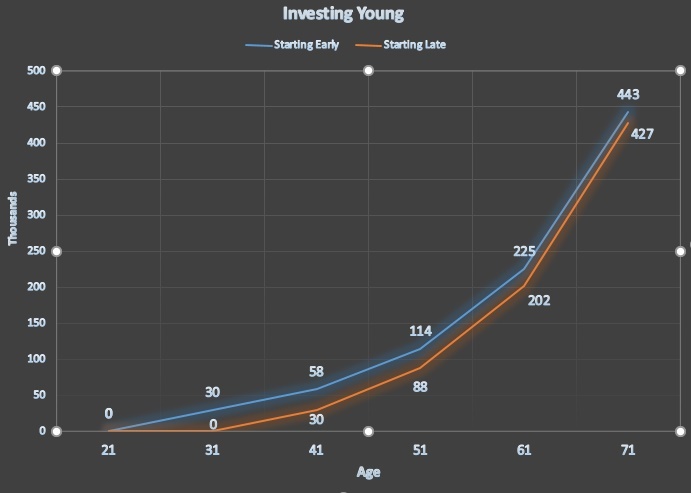 If you invest $2,000 annually for ten years between the ages of 21 and 31 you’ll have more money when you turn 71 than if you invest $2,000 annually for 40 years between the ages of 31 and 71. 2. Become your own boss: Getting more LGBTQ people into leadership positions is another passion of ours. We need more queer people to be the bosses and leaders of industries to influence what diversity and inclusion look like in our society. Despite the broader acceptance of the queer community today, there’s still a lot of opportunities to influence what true equality looks like. You’re a pro at something that makes you unique. Use your skills and unique perspective to help your community. Start your own business with a website, podcast, YouTube videos, freelancing or consulting. Today’s economy with all our newer tools offers so much opportunity, but we need to do things in a different way. We believe having a blog is nearly as important as having a resume. We also believe that to build a platform and to have enough influence to change the world, we need more LGBT bloggers. Therefore, we’re advocating for more LGBTQ people to become bloggers and we’re doing what we can to create more LGBT bloggers. It’s only because of our blog that we’ve added to our overall income a $60,000 a year freelancing writing income stream. There’s a wealth of freedom and income for those brave enough to embrace it. Embrace it! 3. Listen to Queer Money™: Even some in our own community don’t know the financial nuances of being LGBTQ. That’s why we created the Queer Money™ podcast. We believe that for our community to become financially successful, we need to talk more about money and our differences when it comes to our money. We, also, highlight on Queer Money™ other successful LGBTQ people and not just those who are financially successful but anyone who’s living their best life. 4. Pay off student loans: Most college graduates today are stressing about their student loans. In two years, we paid off over $51,000 in credit card debt with interest rates much higher than even today’s student loan rates. We’ve worked with so many people who, quicker than they ever thought possible, paid off four times the debt we paid off. Our website is full of tools to help you pay off any form of debt and we talk about paying off student loan debt regularly on Queer Money™. This, however, is our favorite tool to pay off debt. Try it. Whether you already are or want to be independent, these four steps will help you become financially successful and help you avoid the financial insecurity many in our community face today. The stronger you are as an LGBTQ individual, the better you can help us all as a community. Help yourself and help our community by becoming financially stronger. Hey, John. Great advice as always. I wish we could devise another credential for our young people. College is such a waste. I have a degree in journalism and maybe a third of the classes I took pertained to that subject. And I’m not anti-education. I just question the value of higher education’s current business model. Does every major really need forty classes to effectively cover its core principles and knowledge? Oh, well. Perhaps one day acquiring a skill won’t require a boatload of debt. In the meantime, young people would be wise to heed your wisdom. Thank You, guys, for presenting information for our LGBT community. I have shared the link with friends and clients, and encourage you to keep providing the blogs and webinar series.